Todd discovering Josh's doodling and thinking he likes another girl. Melanie wants to leave early so she can move into Joe's; Paul agrees that it's fine. A hotel customer comes in and accosts Melanie, he thinks his pear has mice teeth marks on it, Paul comes out and tells the customer (Mr Sylvester) that someone must have dropped the fruit. Mr Sylvester is not having any of it so Paul fobs him off with free wine and fruit! Todd is trying to guess who Josh's mystery girl is, Josh won't give anything away. Todd carries on but Josh won't say anything. The mayor has had a mild heart attack and is going to retire, Dorothy swears Madge to secrecy though, and she also says that Felicity Brent wants to be mayor! 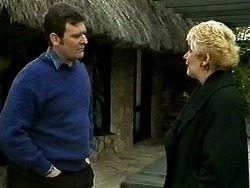 Harold is at the counter and Dorothy goes to pay, he is writing to David about Kerry's accident. Madge asks Harold what she can do to stop Felicity becoming mayor but he doesn't really answer, Madge asks him if he is OK and he nods. Mr Sylvester has rung Melanie, he can hear scratching noises but Paul thinks he's crazy. PAUL: Why do all the nut jobs have to check into Lassiters? Melanie thinks he might be right but Paul tells her to get rid of him. Melanie goes back to her desk and tells Mr Sylvester that it's under investigation. 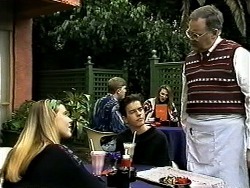 Todd beats Josh on a computer game as Melissa arrives, Josh makes excuses not to spend time with Melissa, when Melissa starts whinging Todd says she can hang out at his house, Josh arranges to meet her at The Coffee Shop at 3, out of Melissa's earshot Todd warns Josh not to mess Melissa around. Paul returns from a meeting, Melanie presents him with some customer complaints. As Paul turns round, he sees Mr Sylvester sitting there; he has found some mice droppings! MR SYLVESTER: Do you want to taste them? 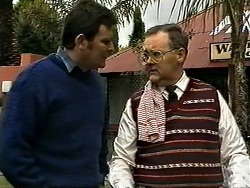 Mr Sylvester leaves and Paul tells Melanie not to tell anyone about the mice and to investigate if anyone else knows. Outside Melissa tells Harold that she is now a vegetarian as Kerry gave her the idea, Harold isn't very responsive though and walks off. Madge spots a mouse as Des approaches; he asks how Harold is coping. Madge is worried; she says he is surrounding himself with Kerry's things. Madge asks Des to talk to him. Still outside, Melanie approaches Harold and asks him if he has seen any mice, Dorothy, Josh, Todd and Melissa all overhear this! HAROLD: How many mice have been seen? MELANIE: Well actually, they're everywhere, it's like a plague but you didn't hear this from me, we're meant to be keeping this quiet. DOROTHY: I bet you are! Melanie lets slip that they are white mice, the penny drops and Melissa decides that it must be the nice from the Science Lab, her, Kerry and Toby released some of them. Melissa decides that this is a good thing! Des approaches Harold, he says Harold should have a holiday or an extended break, Harold won't leave Eddie on his own though. 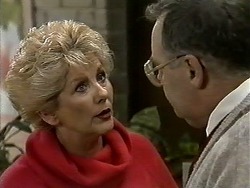 Des reveals that Madge asked him to speak to Harold. Melanie is taking more mice complaints, Mr Sylvester comes in again with a mouse from his room, and he says he has phoned the authorities. PAUL: What else could possibly go wrong? PAUL: I shouldn't have asked. Harold returns early because of the power cut. 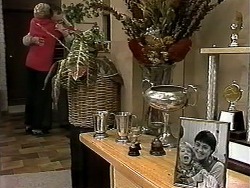 Harold is annoyed that Des spoke to him and that Madge has been gossiping about him, he storms off to his room. The power is restored after the mice chewed through some cables. Melissa comes in, she tells Paul that she won't tell the paper about the mice if he starts using non drift-net caught Tuna, Paul agrees to this. Melissa leaves and quietly asks Melanie about the mice, the exterminator is coming soon, Melissa wishes she could save them again, Paul overhears this but luckily he doesn't catch everything. Todd tells Josh to break up with Melissa but Josh says he likes them both. Harold is looking for Kerry's scrapbook, Madge has put it away and says he should leave it alone as it does him no good looking at it all the time. HAROLD: So you thought you'd hide it? You want me to forget my daughter? You want me to forget her? MADGE: Of course I don't. HAROLD: You'd probably do the same if I died. HAROLD: Kerry was my life….she was my girl. 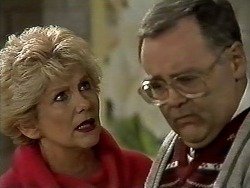 Harold starts to sob as Madge holds him.